Thanks to Courtney of Cinema Axis for this recommendation. Brief Synopsis – A businessman hires a private detective to find the lost key to a safety deposit box, but nothing is really as it seems. My Take on it – This is yet another film that I had never heard of before it was suggested to me and I loved it so much. There is no question in my mind that this is my favorite film of the 55 chosen for this series. Bill Pullman is superbly cast in the lead as Daryl Zero and we can easily love his quirks mainly because he complement it all with his superior methods of solving crimes. Loved the way that they use narration to explain the complex methods of his mind and it makes him feel like a modern day Sherlock Holmes with Ben Stiller as his faithful “Watson”. The story moves along at a great pace and they expertly leave clues around little by little to explain to us what it really going on. There are points where the plot seems very convoluted yet by the end it all makes perfect sense when they put it all together just like in many of Sherlock Holmes’ stories. Bottom Line – By far, the best film that I watched for this series. Pullman is great as the detective Daryl Zero and I loved how the narration explains his methods to us. 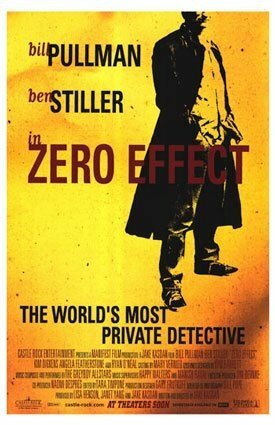 He feels like a modern day Sherlock Holmes with Stiller playing his “Watson” so well. The story moves along at a great pace and they constantly reveal more and more clues as to what is truly going on. The plot may seem convoluted, but in the end, it all comes together really well in order for us to completely understand what is going on. Highly Recommended! This is a really fun film! Pullman is great! totally agree. tnx 4 stopping by and commenting Eric!